Rivet, Bolt-up, Wide-span or Steel - which is your choice? Discover the wide ranging selection of shelving available from our manufacturer partners. Let us assist you with any shelving project whether for a single shelving unit, distribution center pick module, parts room, or other stock storage. 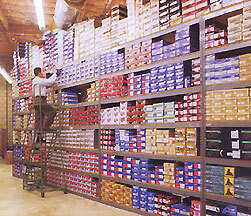 We provide space-efficient layouts and implement cost-effective shelving solutions.